Christmas is coming early this year. I usually save my Christmas article for later in the month of December, but the good folks at Rifftrax preempted me by scheduling their riff of Santa Claus Conquers the Martians to come to movie theaters on December 5, 2013. That just so happens to be the very film I had planned all year to do a Movie Matchup on, so I’ll just have to move my review up to coincide with their schedule. I hate to ruin any childhoods, but it turns out that Chitty Chitty Bang Bang has pretty much the same story as Santa Claus Conquers the Martians. I know, Chitty Chitty Bang Bang is based on the novel by James Bond creator Ian Fleming. But just about all of Ian Flemings novels that were turned into films were changed so much in the adaptation that they’re virtually unrecognizable. That’s definitely true of Chitty Chitty Bang Bang, as I pointed out in another article. So, strangely enough, the makers of the film Chitty Chitty Bang Bang decided to use a lot of story elements from Santa Claus Conquers the Martians rather than Fleming’s original story. Admittedly, this Movie Matchup won’t be as in-depth and conclusive as the one I did on Stanley Kubrick’s The Shining and Manos: The Hands of Fate. But the similarities between Chitty Chitty Bang Bang and Santa Claus Conquers the Martians are still quite striking. First, let’s briefly go through the similarities between these two films and then expand upon them in greater detail. The main character is a great inventor. An old man is kidnapped and taken to a new land. The old man is forced to do a job he’s not really meant for. The heroes disguise themselves and aren’t recognized by the villain. The final battle involves lots of kids fighting grownups. The heroes return triumphantly to their home. The main character of each film is an ingenious inventor. Caractacus Potts is an aspiring inventor who winds up inadvertently creating a candy whistle. Santa Claus is the most famous toymaker of all who works with his elves to create new dolls and games for children each Christmas. An elderly gentleman is taken from his home and transported to a strange new place. Caractacus’ father, Grandpa Potts, is mistakenly taken hostage by the evil Baron Bomburst and flown to the magical land of Vulgaria. Santa Claus is kidnapped by some Martians and flown in a spaceship to Mars. In addition to the old man, two children are kidnapped. Caractacus and his two children follow Grandpa Potts to Vulgaria and the children are quickly captured by the Child Catcher. It’s a little different in Santa Claus Conquers the Martians because the children are kidnapped before the Martians locate Santa Claus. The results are the same, though: the old man and two children are held by the villain at the same time. The old man’s captors force him to use his “inventing” skills. Baron Bomburst thinks that Grandpa Potts is his talented son Caractacus, so he demands that Potts build a new version of Chitty Chitty Bang Bang. Grandpa Potts bluffs his way through because he actually has no skills as an inventor. Santa Claus is forced to use a machine to create toys for children all across Mars, although if the Martians were intelligent enough to create such a machine they really wouldn’t have any need for Santa in the first place. All Santa has to do is push buttons, so his presence on Mars is unnecessary, and he doesn’t enjoy pushing buttons when he’s used to making toys by hand. The villain has an inexplicable animosity toward children. Baron Bomburst and his wife, the Baroness, hate children. So they outlawed children from their country. I’m pretty sure this governmental policy would wreak havoc on the country’s demographics, but hey, at least there’d be one generation of peace and quiet. Voldar is the meanest Martian, and he tries to kill Santa and the children several times. He thinks children are extremely annoying, in general, and he doesn’t want anyone spreading toys and games among them to make them even more of a nuisance. At least one character dons a disguise to avoid detection by the villain. After the children are kidnapped, Caractacus and his girlfriend, Truly Scrumptious, make themselves look like toys to sneak into the Baron’s house like a Trojan Horse. A silly Martian named Dropo dresses like Santa Claus for kicks and giggles, but he gets ambushed by Voldar, who stupidly mistakes him for the real Santa and takes him to his secret lair. A bunch of children take on the villains in a climactic final battle. All of the Vulgarian children who have been living in hiding fight back against the Baron and Baroness to overthrow them and free Caractacus’ kids. 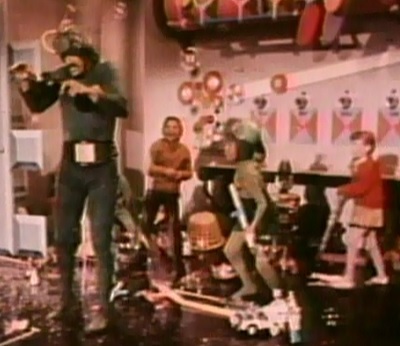 In Santa Claus Conquers the Martians, the Earth children and the Martian children team up to defeat Voldar using nothing but toys. Oh, the irony. The victorious heroes go home. After liberating Vulgaria, Caractacus, Truly, and the children fly home in Chitty Chitty Bang Bang. It turns out the whole thing was just a story that Caractacus told his children, but they still get a happy ending in real life, too, when they return home. Santa and the two children who were kidnapped with him return to Earth in a spaceship just in time for Christmas Eve. The whole thing could have been a dream for how bizarre and surreal the whole thing is, but that might be giving the filmmakers too much credit. 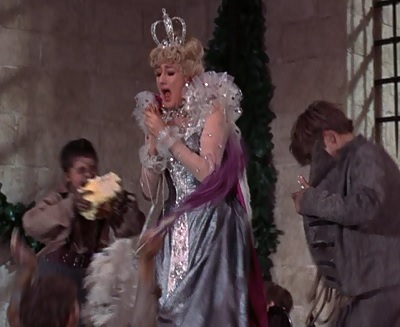 Did the makers of Chitty Chitty Bang Bang know they were patterning their classic musical after a failed kids’ movie called Santa Claus Conquers the Martians? Probably not any more than the makers of Iron Man 2 knew they were copying the utter failure that is RoboCop 2. It’s likely just a coincidence that these two films have so much in common. 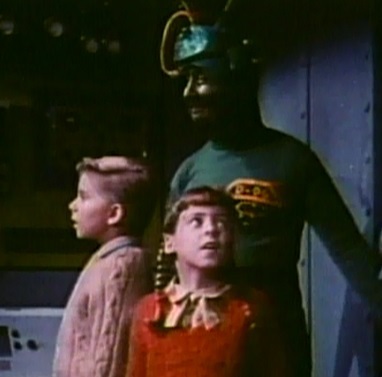 But the next time you feel the desire to trash on Santa Claus Conquers the Martians, try to remember to go a little easy on it because it may be a terrible movie, but it had the seed of a good film hidden somewhere underneath the gaudy green makeup and TV antennae costumes. This entry was posted in Movie Matchups and tagged chitty chitty bang bang, christmas, comedy, films, fun, funny, holiday, humor, ian fleming, james bond, movie review, movies, movies based on books, mst3k, musical, rifftrax, romance, santa claus. Bookmark the permalink. I didn’t know what the movie was called, but seeing the pics you have of the Santa and Martians movie I have to admit I had seen part of that movie some time ago and wondered what the heck kind of movie it was. I didn’t see much of it, but that was only because it was SO bad. 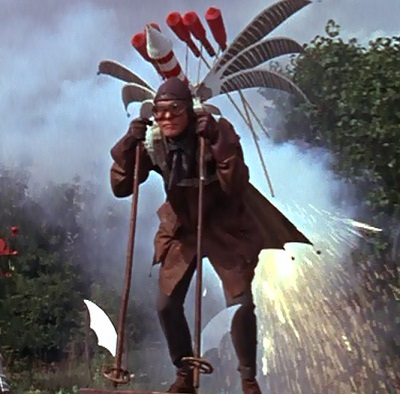 I think I’ll stick with Chitty Chitty Bang Bang, even though it’s a bit strange and non-sensical at times at least there are some good and fun things to remember about it.